COBIS supplied a detailed specification for the digital platform, but equally importantly the team were seeking a provider who could form an effective working relationship with them, providing advice and support beyond the software aspect of the project. Working closely with the COBIS team, led by Peter Simpson, we designed a custom Moodle solution which would incorporate and integrate the two key elements, alongside an implementation plan to ensure the COBIS team would be guided at each stage of the process, and properly supported post-launch. The new platform was designed from a user-centric perspective, with a clean and clear interface. We developed a fully responsive theme to guarantee usability across a range of devices, and followed COBIS brand guidelines to ensure a consistent appearance with the organisation’s existing web properties. For hosting, we used Amazon Web Services, to ensure capacity for the projected user group at launch, as well as allowing easy scalability for future growth. Using cloud hosting in this way ensured costs were kept low initially, with capacity expanding as needed – ideal for the gradual rollout which COBIS had planned for. With the project now in the initial rollout stage, we look forward to feedback from COBIS members. “The LMS built by Titus Learning is a very important part of the COBIS Patron’s Accreditation and Compliance scheme. 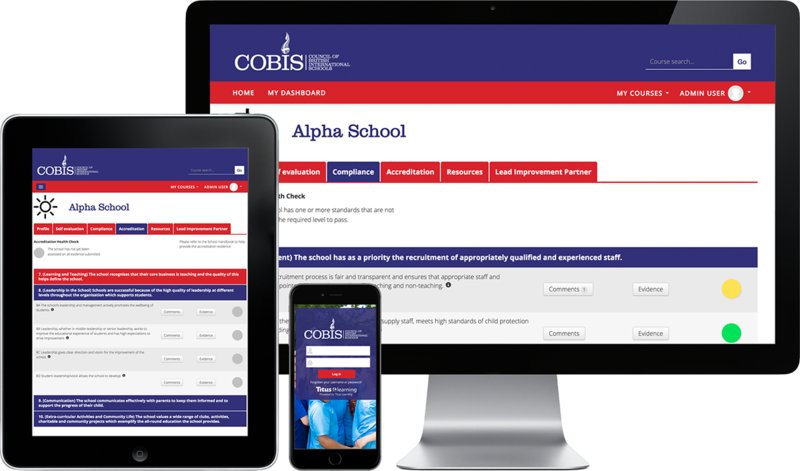 It allows COBIS to stand out from other accreditation programmes by providing a seamless digital experience for schools working towards a global British mark of quality.